As a consumerist society, it’s been engrained in everyone’s minds from the first time they stepped foot into a store or saw a commercial, that is shopping a good thing; a fun thing. And it is. There’s no question that every time you make a purchase you instantly feel better, happier. After all, your body floods with endorphins each time you buy an item. Like a drug, the need to keep chasing that endorphin rush is inevitable. While making a purchase every now and then is perfectly fine, it’s when it becomes a consistent practice that you can get into trouble. Many adults are in massive debt for just that reason. Nonetheless, that doesn’t mean you have to give it up altogether. If you truly love shopping, there are ways to continue to enjoy the habit without overdoing it. 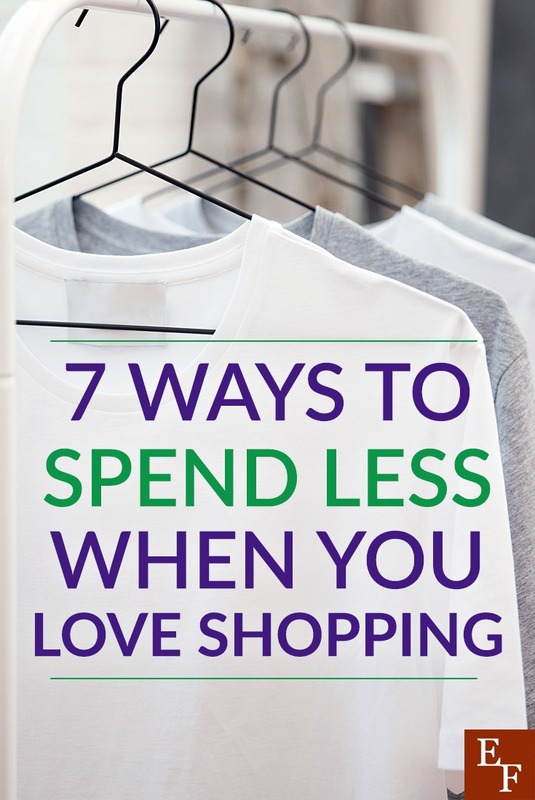 Before going on your next shopping spree or even into your next store, consider these seven ways to spend a little less. Too often than not, you find yourself going into a store for one item only to come out with ten. In many cases, you may look back on the experience and aren’t quite sure how it happened. To begin a journey towards saving, one quick fix is to always go into a store with a list, and that isn’t just the case for the grocery store. If you’re truly going shopping for a few particular items, write them down and make a point to stick to that list, also make sure to use coupon codes to save some money. You’ll still purchase what you need without grabbing extras from end-caps or checkout displays and save yourself money overall. Trying on clothes is no doubt a pain. No one loves getting undressed or getting their hair disheveled from pulling items over their head. Ergo, all too often, you might see an item, grab the size you’d normally wear, and purchase it without ever ensuring it fits. Once home, you find that the size isn’t quite right or that dress doesn’t hang or fit quite as you’d hoped. As laziness wins out, and we convince ourselves we might lose weight or that it’s simply not that bad, we end up keeping an item we don’t truly love. Months later it’s still sitting at the back of your closet unworn, money wasted. Before heading to the checkout counter, make a point to try absolutely everything on. By the sheer fact that you might not love everything you’ve picked, you’ll save yourself money by only purchasing things you’ll actually wear. Anymore, there’s an app for just about everything you could imagine; that includes ones specifically made to provide you with discounts from Reviewloft.co.uk and deals. Apps like Retail Me Not have listings for all your favorite stores, including J. Crew, PacSun, Macy’s, etc. On the app you’ll find great coupons and sale listings for both in-store and online shopping. By browsing the app beforehand, you can take advantage of great savings and still purchase that top you want. If you’re shopping online, check out Ebates to help you save money in thousands of online stores. Have you ever been in a store where a sales clerk handed you a basket or large bag? What initially seems like a courtesy, in some cases, is actually a sales tactic to persuade you to purchase more. While it’s inconvenient to carry around your clothes or goods in-hand, you’d be surprised to find that you actually spend less. Because you can’t carry quite as much, you won’t be inclined to pick up as many extra items than if you’d had a basket or bag. In the end, you’ll grab less on impulse and spend less overall. Most stores in one way or another possess a rewards program. In many instances, there’s a variety of ways in which you can earn rewards from your favorite and go-to retailers. From actions like liking or following your favorites on social media to signing up for newsletters or rewards cards, stores provide an array of options for your to earn things like discounts or cash back. In most cases, you’ll rack up points for certain discounts or rewards each time you purchase something, which you can then put towards future purchases. Utilizing these rewards are bound to save you money in the long-run, just so long as you don’t use it as an excuse to go on a shopping spree. Have you ever purchased something only to find yourself regretting it the next week or even day? As humans we have an unfortunate tendency to make purchases and decisions on an impulse without stopping to weigh the pros and cons. Before making any major, or even smaller for that matter, buy take a day, or a couple depending on the item, to sleep on it and think it over. If you still truly want it after giving yourself some time, then you can go ahead purchase. However, you may find that some of your wants are impulses and in the end you may forgo the purchase altogether. One of the biggest problems with shopping is the tendency to go over budget. Instead of going in blindly, one way to save or at least ensure you stay within your limits is to always shop with a limit. Set yourself a monthly limit in your budget for your shopping wants and set it aside in cash. Once that set amount of cash is out, you’ll have to wait until the next month to make any further purchases. By doing so, you’ll still be able to enjoy a shopping trip without going into debt. Most of us enjoy treating ourselves every now and then. After all, life is short, so you should be able to use that hard-earned paycheck on something fun sometimes. That said, there are some of us who simply love to shop; it’s our hobby if you will. Unfortunately, it’s a hobby that can get you into financial trouble if you’re not careful. Nonetheless, by shopping with a few easy tricks, you can still enjoy your favorite stores and hopefully save money as well. What are some other money-saving apps you’ve found? What stores have you found to have great discounts and deals?